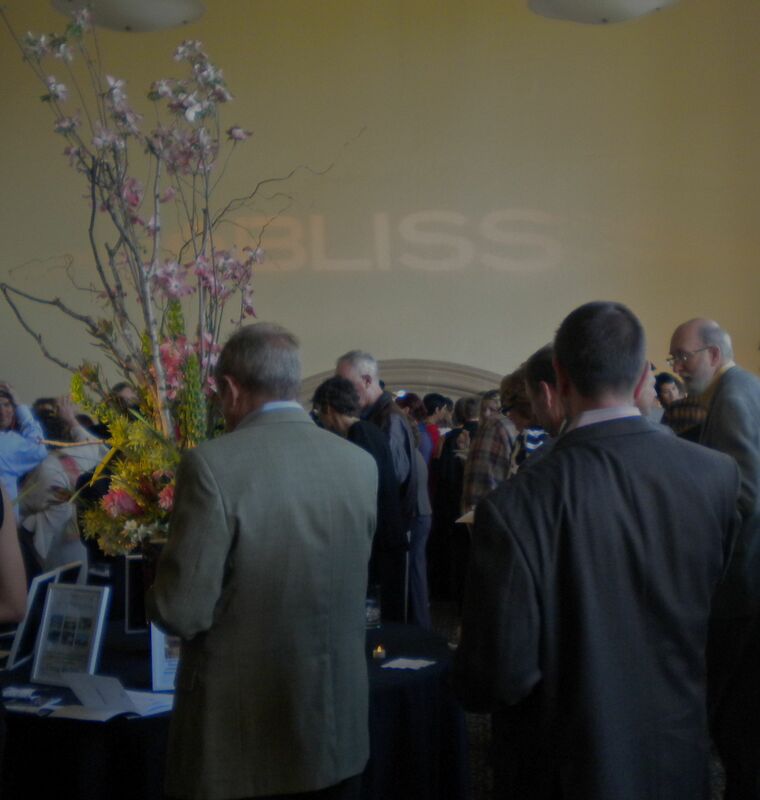 I attended Bliss last night – the annual fundraiser for Maitri, the hospice run by the San Francisco Zen Center. The facility primarily serves people with end-stage AIDS, but it was where my friend George spent his final days last year. His life was ended by a sarcoma. George had been a Maitri Board member for years. The event was held at the Presidio in the Golden Gate Club. What a place. No longer a military post, the grounds that overlook the Bay and Golden Gate now is home to wonderful creative endeavors, including Industrial Light and Magic. Acres and acres of creativity, beautiful architecture, and a forest of native trees. What a place to celebrate the work that Maitri does and the lives that have passed through its facility. Taiko drums greeted guests on the patio as they entered the event. But these were not traditional Taiko drummers. I call them the Taiko Drum Crones. There was such joy in their performance. A Gamelan orchestra performed, then provided the music for Balinese dancers, who told a story with their hands, their feet, their body, and their eyes. George died five months ago today. Maitri certainly provided the house of shelter for George’s pilgrimage towards death. Their attention to the aesthetics, including their providing nourishing food that was pleasing to the palate as well as to the eye, is a reminder that we are living even as we are dying. It is to me what compassion for being human is about. George’s passing happened in the fast lane. It barreled down that road at lightning speed – a bare 15 months between his diagnosis and death. Now, five months later, life continues. The lilacs that burst into bloom in my garden are already fading. They have had their moment in the sun. A few days ago it was cold and rainy. Today the air of the blue sky is somewhere between spring and summer. It is a gentle day. Life is change. Follow your bliss. I used to wonder what my bliss was. I thought it had to be something big. The dictionary defines it as profound happiness. So much of my life has been spent measuring the value of what I was doing by whether I was being nice enough. And nice meant making people happy and keeping them happy. Which is, of course, an impossible task. Happiness is fleeting. I don’t like that word happy, or happiness. It seems so limiting to me. For me it does not embrace sorrow, and I don’t think you can experience true joy if you are not willing to also embrace sorrow. Joy leads to sorrow and sorrow leads to joy. And so, my bliss is found in the answer to the question that wall keeps insisting that I answer before it will let me pass: what do you want to do with your time and your life? Having the faith to follow your bliss – well, that is a challenge. But then, so is life. This entry was posted in Following your bliss, Living, On Being Authentic, On Turning 60, Slaying dragons, Writing and tagged bliss, Following your bliss, george stevens, joy, life and death, Life in the fast lane, Maitri, Presidio. Bookmark the permalink.